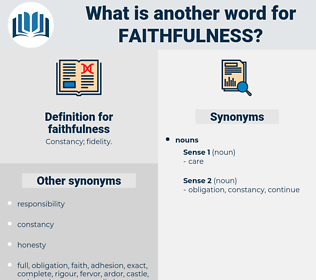 What is another word for faithfulness? repeatability, devotion, attachment, reliability, commitment, compliance. 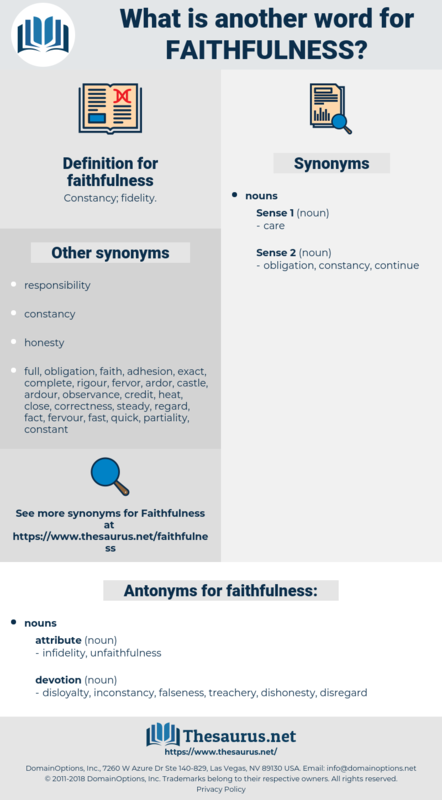 allegiance, faithful, sincerity, faith, fealty, honesty, fairness, dedication, truthfulness, adherence, accuracy. disloyalty, inconstancy, falseness, treachery, dishonesty, disregard. disaffection, sedition, separation, rebellion, treason, estrangement, alienation. We have known Mr. Ray for several years and delight to bear testimony to his ability and faithfulness as a preacher and pastor. Your lord will not forget the faithfulness you show toward us.